The Law Library has many resources to help you prepare for the Uniform Bar Exam in July. For those of you taking final exams, the MBE questions can be helpful as you study for civil procedure, property, and evidence. There are some MBE questions on civil procedure available on the NCBEX website. The Library website has a resource guide to the bar exam that includes general information, links to bar examiners’ websites, and links to many resources, both print and online. We wrote about our study aids earlier this month, and have Examples & Explanations, Nutshells, Q&As and many other resources for almost every area of law. MEE Questions and Analyses, KF303 .M44 (Reserve). 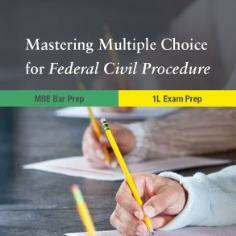 Includes multistate essay exams questions, 2011-2015. MPTs and Point Sheets, KF303 .M672 (Reserve). Includes MPTs from 2005, 2007, 2008, 2009, 2010, 2011, 2012, 2013, 2014, and 2015. Strategies and Tactics for the Finz Multistate Method, KF303 .F56 2013 (Reserve). MBE questions and answers for constitutional law, contracts, criminal law, evidence, property, and torts. Strategies and Tactics for the MBE, KF303 .W345 2013 (Reserve). MBE questions and answers for constitutional law, contracts, criminal law & procedure, evidence, real property & future interests, and torts. Strategies and Tactics for the MBE Volume II, KF303 .E46 2010 (Reserve). MBE questions and answers for constitutional law, contracts, criminal law & procedure, evidence, real property, and torts. Good luck on your final exams, and on the bar exam in July.